The digital age is upon us, and the time has come to stop filling out redundant paper forms or wasting precious moments filing, searching, updating, etc. PT Dental has been designed from the ground up to transform your practice into a paperless office by creating a system of paperless forms, questionnaires, and surveys to be accessed from anywhere, at any time. From the moment a new patient calls to the moment they leave your office, all information necessary can be recorded digitally. PT Dental is a PRM, or Patient Relations Management program (see "What is a PRM? "), streamlining the exchange between you and your patients. New patient forms are available online for the patient to fill out from the comfort of their home, and the data is made available to staff and providers immediately, whether at the office or on the go. PT Dental removes the cumbersome process of searching old paper files, reviewing information, updating, and re-filing, and greatly reduces or eliminates operating costs related to on/off-site file storage, as well as the lost time and productivity. Your patients will love the familiar yet hi-tech user experience of filling out their forms digitally, and will love the time-saving benefits of not having to re-fill out forms for each child or spouse. Your staff will love being able to retrieve all patient information with the instant click of a button, and the ability to review past information and be notified of important conditions. 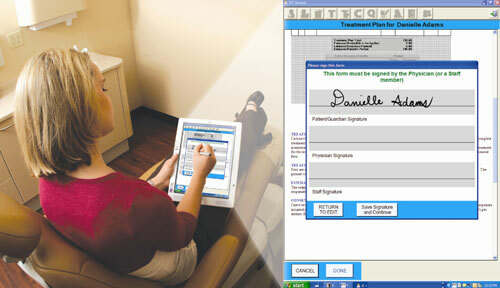 PT Dental is the solution to take your existing office paperless, without altering how your practice functions! Streamlined Check-In - Patients sign in with fingerprint or personal info. Patient Queue - Know where every patient is during their visit. PMP Integration - Integrates with your existing practice management program. DataSync - No manual entry or duplication! All info synched automatically. Clinical Forms - Use your current paper forms digitally. Staff Messaging - Send a quick message to any staff or provider instantly. Email Reminders - Automatically sends out email appointment reminders! Online Forms - Patients can complete forms from the comfort of their home. Data Exchange - Transfer data to any electronic source effortlessly. Multi-Office - Multiple Locations? No problem, keep them all synched! MobileData - Running here and there? Keep your office's database with you.